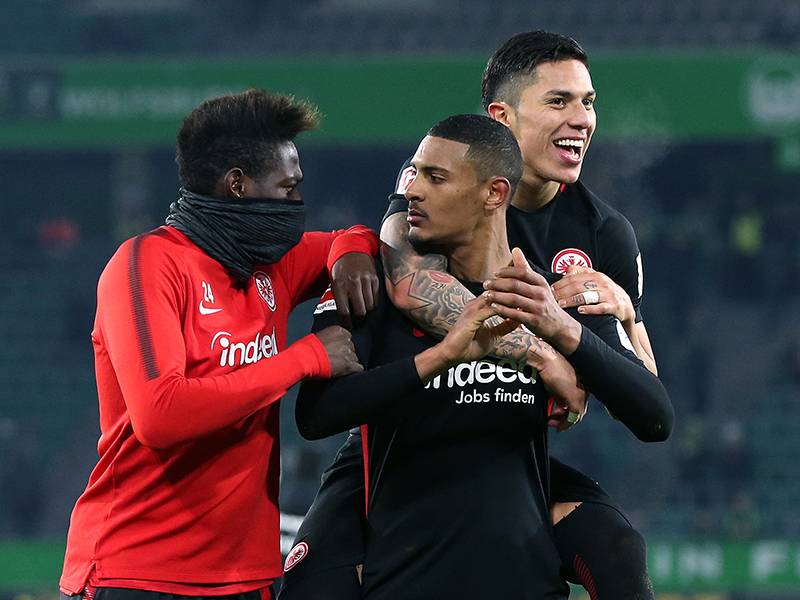 Die Adler ran out comfortable winners on Saturday afternoon as the Volkswagen Arena hosted Wolfsburg vs Eintracht Frankfurt. The action was immediate – inside the first thirty seconds, Dimata was brought down on the edge of the area as the hosts looked to score early on. Arnold floated in a dangerous free-kick but Hradecky in the Frankfurt goal was equal to it. Die Wölfe looked hungry, and as the first ten minutes past it was the home side who looked the more likely to score first. Once Frankfurt woke up they matched Wolfsburg in every department, the early action giving way to an attritional battle in the midfield. For all their early probing, Wolfsburg began to fade. First, Yunus Mallı repeatedly gave the ball away – much to the anger of the home crowd before Sebastien Haller out muscled Tisserand inside the Wolfsburg box. The Frankfurt striker easily held the centre back off before turning and unleashing an unstoppable shot – Casteels could only watch it rifle into the top corner, it was a stunning finish. Fast forward three minutes and the visors had doubled their lead, Frankfurt hitting two goals in quick succession. Chandler unmarked at the far post tapped the ball home – it had been an incredible few moments for die Adler, and one that ultimately put the game out of Wolfsburg’s reach. To their credit, the home side pushed on and shortly before the break they had their first real sight of goal. Divock Origi unlucky not to get his head on a delightfully chipped cross by Arnold. As the referee brought the first half to a close Wolfsburg hadn’t given up all hope, even if the two quick goals had stunned those in attendance. The second half started in much the way the first one had ended, this time, however, there was an edge to the proceedings. Both sides were becoming increasingly frustrated with each other and the tackles began to fly in. Eventually, the game regained some sort of rhythm and on 67 minutes Wolfsburg dragged themselves back into contention. Frankfurt’s Falette brought down substitute Steffen on the edge of the area, from the resulting free-kick Maximilian Arnold scored an absolute pearler – it was in every way a perfect strike. Just as Wolfsburg looked to have brought themselves closer to achieving a positive result Dimata received his marching orders. Bringing down Mascarell he gave the referee no alternative but to show him his second yellow card, it was a foolish error that cost the hosts a shot at regaining a foothold in the match. Frankfurt made the extra man pay – on 85 minutes substitute Jovic put the game beyond all doubt. Stabbing the ball home from three yards his goal signalled an early exit for the home fans, witnessing enough they headed for the turnstiles. The forward opened the scoring on what was to be a positive afternoon for him. Frankfurt’s dominance was too much for their hosts to handle and Haller was a constant thorn in the side of die Wölfe from start to finish. Holding off Tisserand he turned and shot from the edge of the area – it was a thunderbolt and Casteels had no chance. In a massive show of strength, the attacker displayed a high level of composure to score one of the best goals on Matchday 19. Die Adler stunned their hosts in five action packed minutes. Man of the match, Haller and USMNT international Timothy Chandler silenced the home crowd as they hit the net twice in a matter of moments. 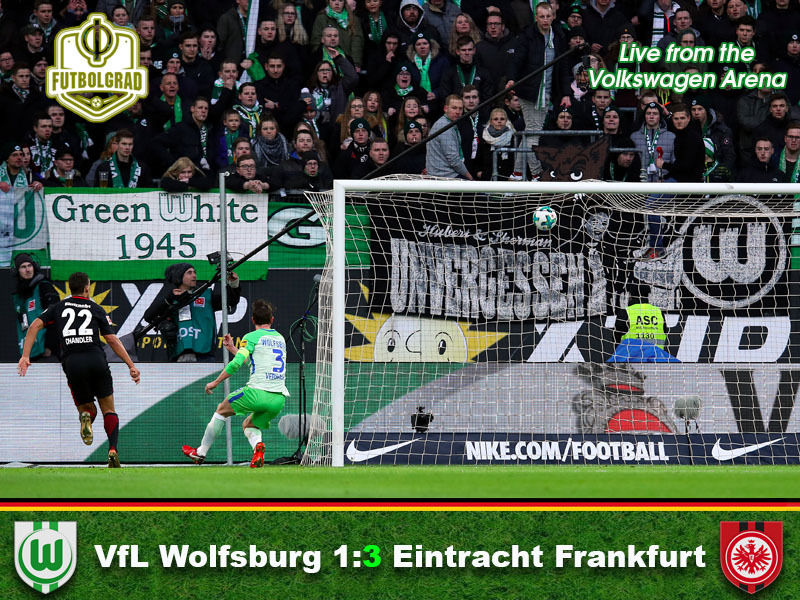 It was an act that Wolfsburg never truly recovered from. Eintracht win at the Volkswagen Arena for the first time since December 2012. Die Wölfe drop to 13th in the Bundesliga table. Niko Kovac finally defeats Wolfsburg as a coach, at the fourth time of asking.